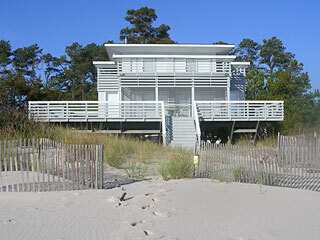 Beachfront home with white sandy beach fronting the Chesapeake Bay. 3 Bedrooms/2 full bathrooms, living room & kitchen combo facing the Bay with a large screened porch. Open deck on second floor off Master Bedroom. This home has an occupancy of 6. Beds- King, Double, Twin, Futon that is a double as well. Home offers Central a/c and washer & dryer, tv. Outside you'll find wide views of the Chesapeake Bay, and a beautiful white sandy beach for long walks and great for children. No pets, No Smoking, You provide your own linens.